If you think a stew needs to be meat based then think on! Cod loin is robust and meaty in its own right and will convert even the biggest carnivore! 1. Take a large pan and heat the oil over a medium heat. Add in the chorizo and fry until golden and fragrant. Remove from the pan and set aside. Next up goes in the onion, garlic and chilli for a couple of minutes until softening. I then add the paprika and red pepper and cook for a further minute making sure it’s well mixed in. 2. The butter beans need to in next and stir gently so they get coated with the onion. Add the tomatoes, stock, chorizo, vinegar and thyme and bring to the boil. Lower to a simmer, cover and cook until the sauce is thick and reduced. Just a few minutes before the stew is ready pop thespinach through the stew and add the cod loins into the pan to steam. You can leave the fish whole or cut it into chunks of you prefer. Cod loin is best for this as it will stay whole. 3. Dig the thyme sprigs out of the pan and check the seasoning. Chorizo is quite salty so you may find you don’t need to do too much. Serve in deep bowls with hunks of warm bread on the side. 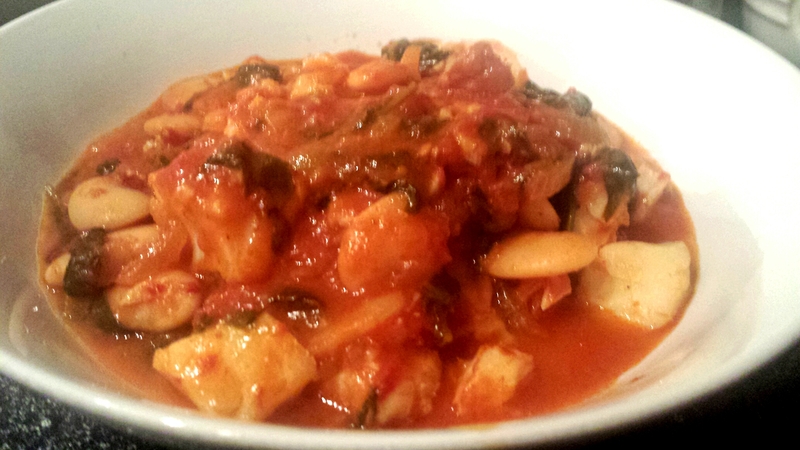 This entry was posted in Recipes and tagged beans, butter beans, chorizo, cod, cod lions, garlic, onion, stew by sotiris14. Bookmark the permalink. My OH adores butter beans so this is a perfect one for him! It sounds lovely – and perfect winter food, without being too heavy!